As more and more of you are talking to Trevor on a frequent basis in his role as Assistant Manager at the 76th Street West Marine I thought you might be interested in his alter-ego: Snipers, Hand of A'dal. Yes it's true, my children play video games. (Of course, so do I!) In his role as "leader" of the Guild "Rocket Science" on the "Uther" server Trevor battles for the Alliance against the Horde several nights per week. You can visit his character sheet here http://www.wowarmory.com/character-sheet.xml?r=Uther&n=Snipers (his main, of course, you had to find his alts by yourself.) Are you good enought to be a Rocket Scientist? The guild is here: http://www.rocketsciencewow.com/ (You might note that Cyberwarrior is not a member - that is because I have been deemed not good enough! View Larger Map Have you ever noticed how much the Brits' like to build things on rocks? I followed Nigel's instructions and worked my way down the river from Rebel's mooring. What do I find? Of course - a rock with a bunch of funny looking buildings. Want to bet this belongs to the British Navy? I am sure Nigel will let us know! Roger, Yes, this is the place and I've also sent you a Google Earth link that should be right on top of Rebels mooring. It usually takes us about 1.5 hours motoring or sailing down to the Plymouth breakwater which then opens onto the English Channel.......not quite the ocean ?? Lake Michigan is both larger and deeper !! However, a good south-westerly gale has a few thousand miles to wind itself up, before it funnels up the channel. If you follow the river south, you can also have a good look at the naval dockyards and the nuclear submarine base.!! Thus, we don't do day sailing, usually at least a long weekend. We spend the travelling time on the river, setting up the sails etc and then packing everything away again when travelling back up river. By planning ahead, we usually travel with the tidal flows which are up to 3 knots on a spring tide. Here is his link - starts right on top of Rebel but you can zoom out! Text of the Draft requiring mandatory membership in US Sailing to race. Draft Prescriptions from the Racing Rules Committee to implement Board policy with respect to required membership in US SAILING, plus a comment: 1. Add a new prescription to rule 46 as shown below: 46 Person in Charge; Membership Requirement A boat shall have on board a person in charge designated by the member or organization that entered the boat. See rule 75. US SAILING prescribes that the person in charge and each helmsperson shall be members of us SAILING or their own national authority. However, any person may steer the boat for reasons of safety or briefly while the 'helmsperson performs a necessary task. This prescription does not apply to [insert one of the optional inserts shown below in red], and it does not apply at an event for which the organizing authority has obtained a written waiver of the prescription's requirement from US SAILING. Optional insert # 1 local races Note: Some of the RRC members recommend defining local as the Appeals Committee in Question 58, where it stated, "Local races are those in which normally the same group of people :from a limited geographic area regularly race together." Optional insert #2 a competitor who races only on weekdays Optional insert #3 . a competitor who races in fivee or fewer races a year. 2. Include the prescription to rule 46 in the list of prescriptions in the prescription to rule 87 (which, in 2009, will become rule 88). With that addition, the prescription to rule 87 will then state that sailing instructions s~ not change the prescription to rule 46. 3. Add two new prescriptions that will have the effect of requiring an event's notice of race to state that rule 46' s prescription will not apply when US SAILING has issued a waiver of the prescription's requirement for the event. Here are drafts of those two prescriptions: . Add a new prescription to be rule J1.2(15) in Appendix J: (15) an exemption, if obtained in writing from US SAILING, to the membership requirements of the prescription to rule 46. Add a new prescription to be paragraph 3.5 in Appendix K, Notice of Race Guide: 3.5 The US SAILING membership requirement in the prescription to rule 46 has been waived/or this event with written permission/rom US SAILING. Marginal note appear in the left margin. opposite new paragraph 3.5: This paragraph is a US SAILING prescription, to be used only when US SAILING has stated in writing that the prescription to rule 46 has been waived for the event 4. Note to the Board concerning Waivers of the membership requirements in the prescription to rule 46: The RRC believes that there may be legal requirements under the Ted Stevens Olympic and Amateur Sports Act and/or The Education Act of 1972 that US SAILING must comply with. (Note: The Education Act of 1972 is often referred to as 'Title IX', which is the title of one part of that act.) . In particular, to comply with one or both of these acts it may be necessary for US SAILING to issue blanket exemptions to the membership requirement for some groups, such as the Interscholastic Sailing Association, the Intercollegiate Sailing Association, and the U. S. Armed Forces. The Racing Rules Committee suggests that the Board ask the Legal Committee to look into this. . . Two specific issues that the Legal Committee might consider are: 1. Section" 220526 of the Ted Stevens Olympic and Amateur Sports Act refers to ''high school students, college students, members of the Armed Forces, or similar groups and categories." 2. Whether a waiver, as described in the last three lines of the draft prescription to rule 46 shown above, meets the requirements of the Ted Stevens Olympic and Amateur Sports Act and The Education Act of 1972. 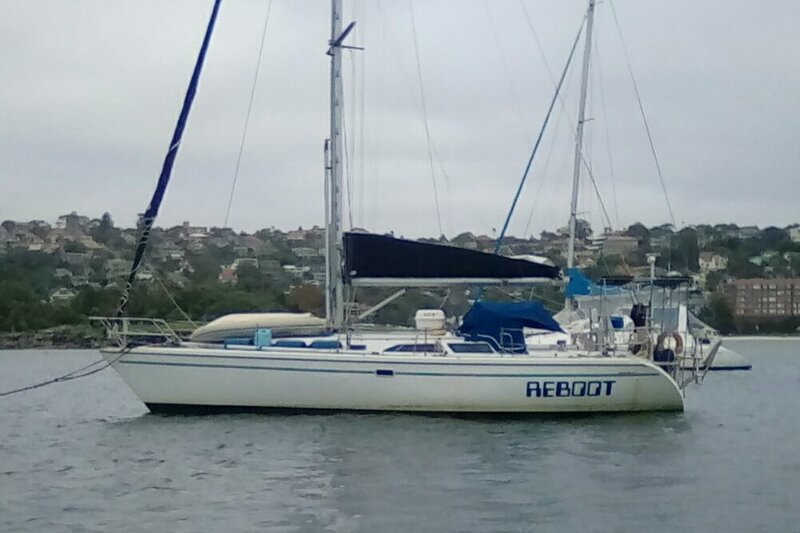 Here is a quick picture of Reboot. You can see the Southwind Marine symbol on the building in the back and the snow/ice still on the ground. Hopefully the rain today will get rid of the snow and we can get to pre-launch work later on this week. While down at Southwind I ran into Bill Emory. Bill was part of the group that brought Merlin back from the West Coast. He tells me that they will be putting it an a building at Southwind to start working on getting it ready for the Mac. He promised me a look and a tour so hopefully that will happen soon. 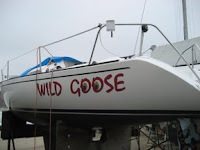 My friend and the Race Committee Chair of MAST Glyn Livermore has an interesting strategy for winterizing the engine of Wild Goose - he puts it in the basement of his home. 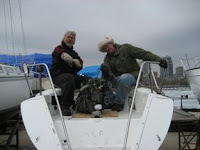 Here Glyn, Joe and I get the engine back down to the Goose for spring launch. Now if the 12 inch thick ice in McKinley Marina would just melt! View Larger Map OK - that is what the signs on Interstate 94 say. But everyone in the Navy knows it as "Great Lakes." On the way back from Crowley's Ed and I stopped by. I needed a replacement sticker for my windshield (the last one went when the windshield was hit by a rock and spider webbed.) While we were there we filled up on gas (actually, it was the third fill up of the day.) We bought $10 in Chicago at $3.74 per gal, then again $10 in Chicago at $3.68 per gal. At Great Lakes it was only $3.32 per gallon. We are paying $3.27 in Milwaukee so it was not that bad. Brad told us that Chicago now has a 10.5% sales tax, the highest in the nation, and that is why gas is so expensive. Anyway, after putting out the "low fuel" light for the third time we went to find the MWR (morale, welfare and recreation) run marina. I had been there once before about 7 years ago and had taken away that it was in pretty rough shape. Well, it still is. But wait, there is a $13 million renovation underway so it will be brought back up to a reasonable state in the near future. So we look forward to at least stopping by and seeing it after they are done. Perhaps an overnight on the seawall. The picture above is the marina. Great fun to play at being back in the Navy! As I drove up Lincoln Memorial Drive this afternoon what to my wondering eyes did I see but a big hole where the United States Coast Guard Lifeboat Station Milwaukee once stood - burned - rotted - fell down - flooded - you get the picture. You actually do, its over there on the left. 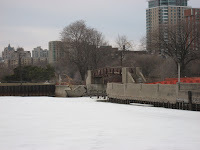 Anyway it's gone so now the work of fixing the seawall and bridge can begin. We will then be getting a nice new play area where once an eyesore stood. Good job Milwaukee County - it only took 7+ years to get the building down. We stopped down at Southwind Marine today to check on Reboot and the spring business hours so we could start our pre-launch work up. FYI: Sunday 9 am to 3 pm Mon - Tues 8 am to 5 pm Wed - 8 am to 8 pm Thur - Sat 8 am to 5 pm We tentatively launch April 21st! Lots to do, lots to do! The seminar is open to all, but space is limited, so registration and payment of the seminar fee ($55 for US SAILING members, $75 for nonmembers) is recommended. The seminar fee includes continental breakfast, morning/afternoon breaks, lunch and all workshop materials. View the US SAILING website for registration and further information. www.ussailing.org Education, Race Offi cer Training, or contact the MYC Secretary, Rachael at 414.271.4455.
and end at 5:30 pm. affect race management will be discussed. At the seminar you will need your own copy of The Racing Rules of Sailing 2005-2008 (“RRS”). I have known John since I moved to Milwaukee and have worked RC with him on several events, the most recent last year's Louie's Last Regatta. John is a great guy and an excellent teacher. I hope to see you there! Oscar Wientjes (Commodore of MAST) and I met with Cindy Kraus (2008 MYC RC Chair) and Ed Purcell (of f-Stop fame) to discuss ways that the two clubs could collaborate. We had a far ranging discussion about a number of topics but I think it is fair to summarize as follows: 1. We feel that there is an advantage to more collaboration between not only MAST and MYC but also the other sailing clubs in the area (e.g. SSYC, MCSS, McBoat.) We are going to try and put together a further meeting to explore collaboration possiblities. 2. We also discussed the need for more outreach to get younger people (given my age that is a very broad group lol) interested in racing. In particular we discussed outreach to the local college community and Hoofers (UW) in Madison. We broadly defined this group as not only those interested in racing but those that don't yet know they are interested in racing! We also had the sense that this effort could be separate from item #1 above and might include local marine oriented businesses as stakeholders. If you are interested in sailboat racing in Milwaukee on Friday nights please check out the MAST web site at http://www.mastracing.org We are always looking for new boats. Don't have a boat? No problem. We are always looking for crew for our many competitors too. Come out to the web site and get involved. From CRAW (the Catamaran Racing Association of Wisconsin) "Hi My name is Dale Eigenberger. I am Vice Commodore of the Catamaran Racing Association of WI (CRAW). Every year we run a regatta in Shell Lake, WI. It's a state vs. state challenge. This year we are trying to promote the event to the neighboring states in order to increase the size of the regatta. Normally there are about 35 boats from the surrounding states. We would like to see that double this year. I am asking for your help to accomplish this. If it would not be too much trouble, could you post the attachment on you web site or bulletin board or both? Feel free to check us out. 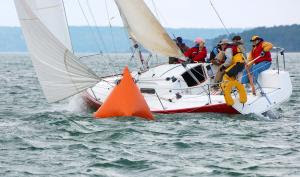 http://www.crawsailing.org/ Thank You in advance.~Dale Eigenberger Vice Commodore CRAW"
FYI: (South Shore Yacht Club Posting) "Racing Rules Workshop – April 19th To refine your rules knowledge, sail smarter, and hopefully stay out of the protest room this season, be sure to mark your calendar for Saturday April 19 to attend the Racing Rules of Sailing – Part 2 workshop. Sponsored by Milwaukee’s T10 Fleet, this advanced racing rules workshop will focus on the rules as they apply around the racecourse, from pre-start to finish. Presented by US SAILING Senior Judge and Umpire, Cliff Black, the Racing Rules of Sailing Workshop – Part 2 – When Boats Meet, is designed to clarify your understanding of the rules as they apply to situations between converging boats. It’s a perfect way to improve your sailing skills without hitting the water. The workshop will be given at South Shore Yacht Club from 9:00 to 3:00. Open to all interested skippers and crew, space is limited and pre-registration is suggested. The $25.00 fee includes a casual lunch and all proceeds will benefit the South Shore Yacht Club Junior Sailing Program. 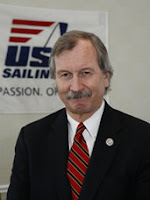 Cliff Black serves as the US SAILING Area K Regional Administrative Judge. Cliff currently serves on the US SAILING Judges Committee, Match Racing Committee, U.S. Match Racing Championship Committee, and U.S. Women’s Match Racing Championship Committee. He is also a member of the Lake Michigan Sail Racing Federation Appeals Committee and a supporter of the Women’s International Match Racing Association. To register contact SSYC at 414 481-2331 and be sure to bring your rulebook with you for this fun and educational workshop." As you can see Merlin made it to Milwaukee. 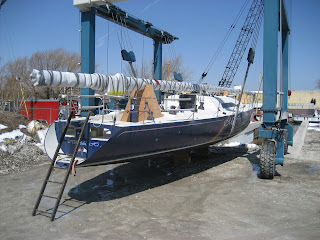 She is currently at Southwind Marine in the slings. No one was around when I stopped down so I was not able to get any scoop. Since Reboot is stored 300 yards away (but still surronded by ice) I am sure that I will be able to get a fill in. Obviously it will need work to prepare it for the Chicago - Mackinac but they do have several months to get it done. Can you see it? Way out by the entrance? Blue water! I was quite surprised the other day when driving over the Hone Bridge that there was not ice anywhere. Or so I thought. Then I drove into McKinley and found that there was still 12 inches (according to the ice fisherman) by the slips. It looks like it is finally starting to melt. Yea! Now if we can only get a clear path to "F" dock. The Mackinac Island Yacht Club will be sponsoring a race around Mackinac Island the Wednesday after the Chicago - Mackinac race. It will start at noon. This should be interesting. The normal process requires all the Chicago - Mackinac boats to have left the Mackinac Island marina by noon on Wednesday. So maybe they can attract some of the Chi-Mac boats. Could be really fun if a large percentage of the 460 boats in the Chicago - Mackinac decide to enter. Or a real zoo. You decide. In "guest commentary" in Scuttlebutt Jim Capron, President, US Sailing describes why he believes it appropriate to make membership in US Sailing mandatory for sailboat racers. The plan is to include this requirement in the 2009-2012 Racing Rules of Sailing. Needless to say there is a lot of resistance to this plan. Most of the resistance is focused around the belief that US Sailing does not provide value to the sailboat racer commensurate with the membership cost. A request from Boat US. I suggest you should take the time to comply: July 23, 2007 (keep reading, this is background, update at bottom of page) Dear BoatUS Member, For 34 years the federal Environmental Protection Agency (EPA) has exempted discharges from recreational boats from the Clean Water Act permit system. Regretfully, a recent court ruling cancelled this permit exemption. EPA is required by the court decision to develop and implement by September 30, 2008 a national permit system for ALL vessels in the United States for a variety of normal operational discharges.We have been working behind the scenes with other boating organizations to get the exemption reinstated for recreational boats. Fortunately, the Recreational Boating Act of 2007 (H.R. 2550) has been introduced by Representatives Gene Taylor (D-Miss) and Candice Miller (R-Mich) which would protect recreational boats from being swept into this unnecessary and expensive permitting system. It is critically important that H.R. 2550 be passed and your support is essential. Please contact your Congressman and Senators TODAY and ask that they co-sponsor or support H.R. 2550. If the permit system becomes a reality, you will be required to pay for a state permit for each of your boats. EPA will be monitoring your deck runoff, grey water, bilge water, engine cooling water, and the use of copper bottom paints. The original lawsuit that led to this court decision sought to address ballast water discharges from large ocean-going ships, which can introduce damaging aquatic invasive species into U.S. waters. Keeping our waterways clean and preventing the spread of invasive species is of utmost importance to the future of boating. But taking a complex permitting system designed for industrial dischargers and applying it to recreational boats will not yield significant environmental benefits and it will come at a very high cost. Requiring recreational boaters to purchase a permit would not prevent the spread of invasive species. BoatUS has been a leader in educating boaters about Clean Boating practices for more than a decade. Our nonprofit Foundation has funded local education projects on invasive species prevention, helped develop voluntary Clean Marina programs, and authored much of the country's Clean Boating outreach. These positive education efforts are making a difference. Please ask your elected federal representatives to support H.R. 2550. It is common-sense legislation. As you send your emails to your Members of Congress, please copy BoatUS at GovtAffairs@BoatUS.com . We'd also like to ask you to send a copy of your correspondence to the EPA, so they can see how this will affect citizens. However, please know that if you choose to send it to EPA, it will become a part of the public record. EPA's email is ow-docket@epa.gov , and your email needs to have a subject line with Docket ID No. OW-2007-0483. For More Information: Click HERE for Frequently Asked Questions Click HEREfor a sample email letter Click here to easily send an email to your Members of Congress. Forward this Action Alert to your friends, your fishing and boat club, your marina neighbors, and your local press! Thank you for your help. Sincerely,Margaret PodlichBoatUS Government Affairs GovtAffairs@BoatUS.com 703-461-2864 or 703-461-2878 x8363 March 19, 2008 NEW SPRING INFORMATION FOR BOATERS AND ANGLERS! We have a new bill, S. 2766, "The Clean Boating Act of 2008", that we need your help to support. This bill will provide a permanent exemption for recreational boaters, anglers, and charter boats, from the looming EPA discharge permit requirement. Over the last 8 months or so, many people have taken the time to support S. 2067 or H.R. 2550 "The Recreational Boating Act of 2007". This new bill, S. 2766 has the best chance of gaining widespread political support from both Democrats and Republicans. It includes all the former contents of S. 2067 and H.R. 2550 as well as a provision to exempt charter boats from the permit and to required EPA and the U.S. Coast Guard to determine reasonable and practical management practices for discharges. We urge every boater, anger, and boat owner to click on the following links to learn more about this new legislation. Please take a few minutes and let your federal Senators and Congressmen know about the importance of boating in your life, and ask them to co-sponsor or support this new legislation. Remember that if we don't get legislation passed, we all need to get EPA permits to operate our boats effective 9/30/08! We have added a new link to "The Racing Rules of Sailing" Blog. It is authored by Jos M Spijkerman, Sneek, Friesland, Netherlands. I don't know if "Sneek" has anything to do with the two boat length rule but we will find out! 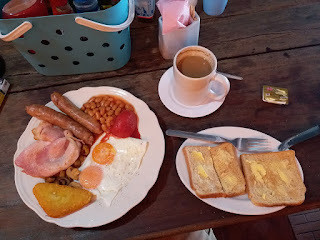 The link is http://rrsstudy.blogspot.com/ and we have also added it as a permanent link on the right edge of the blog. Ladies - mark your calendars. On April 8th at 7 PM the Milwaukee Bay Women's Sailing Organization (http://www.mbwso.org/) will be holding their Spring meeting in the upstairs dining room of the South Shore Yacht Club (http://www.ssyc.org/) New members are wecome and encouraged to attend. South Shore Yacht Club is at 2300 East Nock Rd, Milwaukee, WI 53207 You can also contact Fran Aring at faring@mbwso.org for more information. After seeing 2 boats in the Outer Harbor and wondering why I was still on dry land I stopped by and had a chat with Clarke Johnson today. As always he was pleasant and informative. 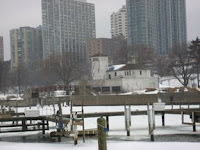 USCG Boat House - apparently they are missing a permit to tear it down. So as soon as the permit is issued the project will get back on track. McKinley early opening: It has been a tradition for McKinley to permit slip holders to bring their boats to the marina before its official opening day of May 1st. The quid pro quo has always been that the marina does not provide any services. I asked Clarke if he had set an "early arrival" date in mind. He laughed and told me "It's up to God. 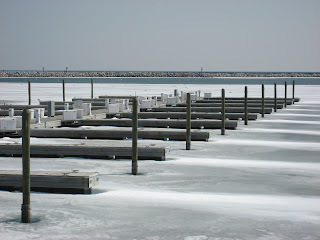 There is still 12 inches of ice in the marina!" So he knows we want to get in as soon as we can but also but also realizes that only ice boats could dock at the moment! Thanks to Boyd we now have a Reboot site at Compete-At. Compete-at is an online sports management service for event organizers, club managers, national sports authorities and so forth. 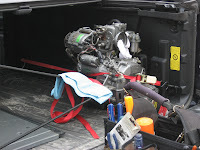 They provide sites for sailing, golf, curling, archery, and fishing. Their main web site is at http://www.compete-at.com. 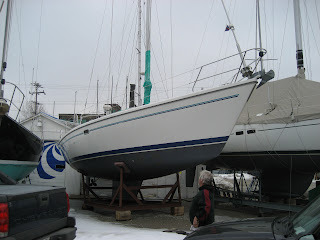 The Reboot site is at http://www.SailSystems-Manager.com/Reboot Come visit it - it's really cool. Even cooler are all the other registered boats. Could this be global warming? Pictures: http://www.crh.noaa.gov/crnews/display_story.php?wfo=mkx&storyid=13545&source=0 "The relatively warmer temperatures and sunshine of the last several days have caused areas of ice that had been affixed to the western shore of Lake Michigan off the Racine and Kenosha areas to break away from the shore. The blustery west winds on Tuesday have carried these floating ice "bergs" several miles away from shore." There was another fire at Skipper Bud's in Winthrop Harbor today (thursday 13th.) Here is the report from CBS News: http://cbs2chicago.com/local/boat.warehouse.fire.2.676466.html From WBBM: http://cbs2chicago.com/local/boat.warehouse.fire.2.676466.html We will let you know more when we know more. Heads east on March 17th. Or so they say. So we should see her in the Chicago Mac after all! As the picture shows - The Coast Guard lifeboat station is still there folks! Perhaps the snowfall has prevented the planned demolition. Demolition was slated to begin February 25 according to the Journal Sentinel. It has been an eyesore for years, I suppose a few more days will not matter. we gave birth to a gigantic yellow submarine. The Milwaukee Community Sailing Center's "Sailor's Ball" took place last night at the Italian Community Center. Over 300 people attended, hundreds of auction items, and of course, the contest for the best decorated pram. We picked our pram location very carefully.....right next to the bar of course! Our submarine looked fantastic! it was our first time seeing her fully assembled (too big for our living room!). I think she ended up over 14 feet long, and about 10 feet high at the top of the tallest periscope. though you couldn't here it over the band, we hid a boom box playing a loop of "yellow submarine" inside the the port hole. i guess you could "feel" the music. She got ooooohed and aaaaahhhed over. lavished with many compliments. and certainly had her picture taken many, many times. The competition was fierce. I know alot of our team thought we had a "slam/dunk", but the MCSC Capital Campaign people came in with an amazing entry. they created a fantastic red dragon that literally came off the painted sail. the votes were tallied, and actually recounted a couple of times. It was so close between us and them. come to find out, only 3 votes between us. we got a respectable 2nd place... and yes, we GOT THE T-SHIRTS. some say far better than the goofy hats they got for first place. I also know for a fact that we had way more fun putting it all together. we had a great time. what a wonderful experience. sure made this winter alot more tolerable. there's something really satisfying about working together for a common goal. lot's of stories and lot's of laughs. Thanks so much for joining us on this silly adventure. it way a joy. Today and for the next two Saturdays (March 8 and 15) the West Marine store on 76th Street in Milwaukee will be having free seminars on bottom prep and painting. They start at 11AM.